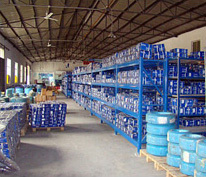 We are one of the prominent importers, traders and wholesalers of wide variety of ball bearings in India. We understand the varying needs and requirements of clients, thus we keep in mind the prerequisite of the clients and the customers. With a vast experience up our sleeve, we are a rapidly growing company in the Ball Bearings industry. We have an efficient team of highly qualified and dedicated professionals. We at PASHUPATI BEARINGS PRIVATE LIMITED aim at delivering the best bearing solutions to our valued clients and customers throughout the country. Small steps lead to a great achievement, slowly but steadily we are climbing the ladder to reach the apex position. It is because of our unending efforts that we have earned a niche or ourselves in the market. You can rely on our product knowledge, expertise, quality control and dependable services. We are a name to reckon with and are the authorized importers and distributors of HCH, one of the leading names of ball bearing industry. Apart from Huanchi Bearing Group Co. Ltd, popularly known as HCH we also deal with a few other renowned China based ball bearings brands. HCH as a brand is known for its reliable and highest quality products. Since the brand is so prominent, we can assure prompt and efficient delivery system. All the products go through a strict and stringent quality check process before they reach you thus ensuring that all our customers and clients get nothing less than best. We take immense pride in our high levels of customer satisfaction.